My doctor just told me that I have gout – and I am disgusted with myself. Let me first say that I have never experienced more pain in my entire life. The pain is focused on my left toe and there is no escaping it. All I keep thinking about is how Ben Franklin, who had gout for years, could have accomplished all that he did because, aside from writing this post, I cannot focus on anything other than the pain. Fortunately, at night I overdose on Nyquil so I’m sleeping okay. But the fact that the gout will probably go away in a week or so is no consolation. 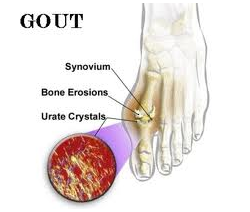 There are many causes of gout. If you eat a lot of rich foods, like shellfish, if you don’t drink enough water, if you don’t exercise, etc. You can also get gout if you drink “heavily.” Let’s talk about that one for a second. My mother was an alcoholic, a mean, nasty one. I didn’t drink until I got to college, then I went nuts. To this day, I do not know how I am alive because there were many times when I drove home from a bar totally inebriated. I don’t remember the rides home. I’m also lucky I never killed anyone. Over the years, I continued to drink. I became what my father used to call his father – a “weekend drunk.” I would play or work all Friday and Saturday but then around 5 o’clock I’d open up the bottle of Vodka or Rum and start making some sweet drinks. Every Saturday and Sunday morning was a nightmare, as my head was one giant hangover. I am now 60 years old and about two years ago – after a gout attack – I vowed to get off the hard stuff. Since then, I haven’t had any more serious alcohol, the only exception being when I visit my good friend Scott in Del Ray Beach and we share a bottle of Southern Comfort as we sit on the shore, talking about life. These days, I “only” drink Amaretto, which is not as alcoholic as the hard stuff. On Friday night at about the same time, I pour a small glass and quietly watch TV. I have about three glasses, which gives me a nice buzz. I wake up the next day with no hangover, I’m ready to go. Then, that Saturday night I do the same. I just sit there quietly and don’t disturb anybody. My two older boys know I drink and at times they have found the hidden bottles and they just throw them out. I don’t say a word to them, but I certainly appreciate their sentiment. I don’t believe I am an alcoholic. I don’t crave alcohol in the mornings and it doesn’t affect my work. It’s just that once I get through the week, I’m ready for my weekend buzz. Maybe I’m in denial. Perhaps if I went to a counselor, he would determine I am technically an alcoholic. I continue to insist that I am not, that I am stronger than those folks who desperately crave a drink. I really don’t know and I don’t care to find out if I am an alcoholic. But this gout has really got me to thinking. I am totally paralyzed and cannot imagine going through this again. For the sake of my kids, my spouse and myself, I gotta stop.